Denmark and France hold the pole in the Group C standings coming into the final Matchday on Tuesday afternoon. A draw keeps France at the very top of the standings and helps Denmark preserve the second position regardless of the outcome of the clash between Australia and Peru. Will we see such scenario at Stadion Luzhniki on the day? Both France and Denmark edged their way to earn the fantastic position ahead of their final round clash at Luzhniki. France have already secured the knockout phase following two narrow wins, while Denmark need a point here to be mathematically safe, regardless of the outcome in Sochi. Important attacking figure Yussuf Poulsen is sidelined after getting booked against both Peru and Australia. France won six points form the opening two games, just as planned. Nevertheless, Les Bleus have anything but impressed en route to such record beating both Australia and Peru narrowly. Griezmann’s opener from the VAR-awarded penalty against Socceroos was probably the most arguable goal of the tournament so far, while Peru well deserved much more than a1-0 defeat when they took on France on Thursday afternoon. Didier Deschamps will certainly need a massive rise in his troops’ form if France are to make a deep run here in Russia. The only goal against Peru came in the latter stages of the first half when Kylian Mbappe slotted home the huge deflection off Alberto Rodriguez after Olivier Giroud’s cross from the left flank. PSG striker thus became the youngest Frenchman ever to score at a major tournament, overtaking David Trezeguet back from the 1998 campaign. The Danes opened the game with Australia in a rather strong fashion knowing that a win there would have sent them to the knockout stages. It was their star man Christian Eriksen who took advantage of Nicolai Jorgensen’s delivery to put the Scandinavians ahead early on. At that point, it seemed that Age Hareide’s side will have no trouble storming past Socceroos, but they just failed to keep up the pace later on. The punishment came through Mile Jedinak’s opener from the spot after a handball by Yussuf Poulsen inside his own box. Yussuf Poulsen was blamed for the penalty against Australia. The RB Leipzig forward was booked in subsequent contests and he is now forced to skip the decisive group stage match. Bordeaux’s Martin Braithwaite might take his place on the right flank in the starting line-up. Experienced midfielder William Kvist is still injured as Lasse Schone is once again expected to take his place alongside Thomas Delaney at the defensive-midfield position. 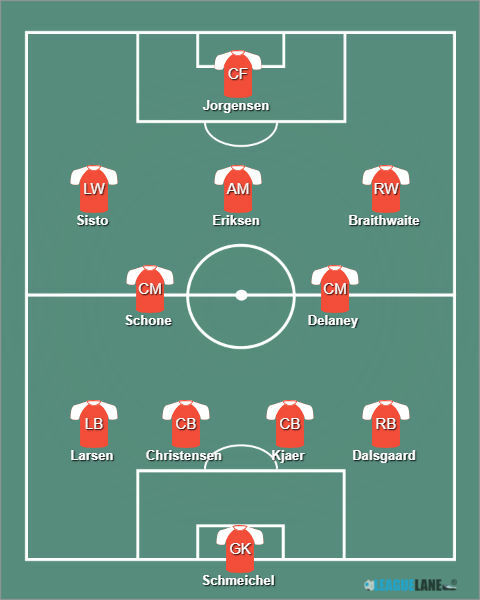 Schmeichel – Dalsgaard, Kjaer, Christensen, Larsen – Schone, Delaney – Braithwaite, Eriksen, Sisto – Jorgensen. Deschamps decided to change the formation and move from 4-3-3 to a more conservative 4-2-3-1 with Olivier Giroud as the man closest to the opponent’s goal. Blaise Matuidi’s wide position on the wing was a bit odd in such structure. Barcelona’s younger Ousmane Dembele lost his place to Olivier Giroud, but could make the return to the starting XI here. It will be interesting to see if Deschamps will make further changes or the team will look similar to the one which faced Peru on Thursday. 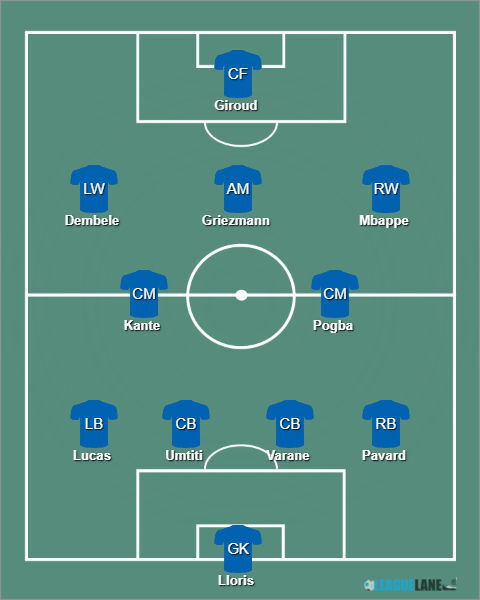 Lloris – Pavard, Varane, Umtiti, Hernandez – Kante, Pogba – Dembele, Griezmann, Mbappe – Giroud. 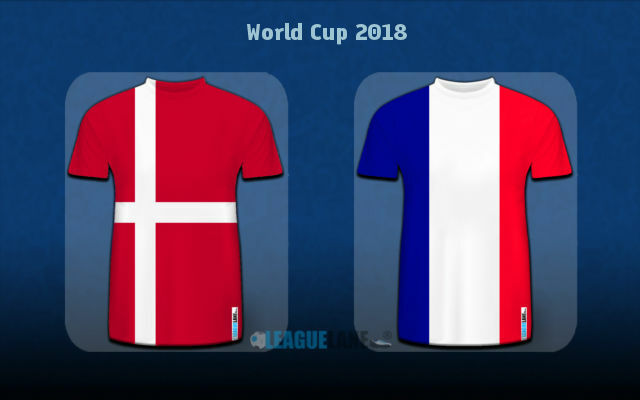 This will be the 14th head to head encounter between Denmark and France. Les Bleus have been much more successful over the course of history, winning on eight occasions and losing juts four times in the process. However, it’s Denmark who came on top when the two sides last locked horns in a World Cup affair, back at the 2002 tournament in Korea/Japan (2-1). France have won three friendlies against Denmark ever since, including two in 2015 (2-0 and 2-1). Even though the draw would work out just fine for both sides, we do believe that France will confirm the difference in quality and clinch a three-pointer to preserve the perfect record before the knockout stages. Deschamps might make some changes to his starting line-up, but he has some world-class quality on the bench too, which is why we find the value in backing Les Bleus to win at the 2.30 odds. Denmark have one such man in their ranks, but will the Spurs’ Christian Eriksen be enough to help his team avoid a defeat and clinch the last 16 round place? In all, we expect a close encounter with very few goal-scoring chances at both ends. Prior to the 1-1 draw to Australia, Kasper Schmeichel has kept five consecutive clean sheets (counting the 1-0 win over Peru at the start of the World Cup), meaning France will hardly bag three or more goals on the day. Predicted Full-Time Result is a narrow 1-0 victory for France. France to win @ 2.30. Under 2.5 goals FT @ 1.44. Correct FT Score: 1-0 France @ 6.00.